Adapt KNORR Mashed potato as you would scratch made mash. Potato cakes and hash browns are easy to make. See this recipe below for inspiration. Fry the Chicken Schnitzels until golden. Remove from oil and keep hot. Bring the water to the boil. Whisk in the KNORR Instant Mashed Potato Mix, remove from heat and allow to cool. Combine the cheese, chives and egg with the cooled potato and mix well. Mould into patties and cook in a large frying pan until golden in colour on both sides. Remove and keep hot. Slice through the centre of the whole garlic bulb exposing the centre of all the cloves. Add a little oil and bake until soft in a preheated oven (180 degree Celsius). Place the water into a large pot and add the KNORR Rich Brown Gravy. Bring to the boil while stirring continuously, reduce heat and simmer for an additional 2 minutes, squeeze out the garlic from the roasted bulb and mix well with the gravy. 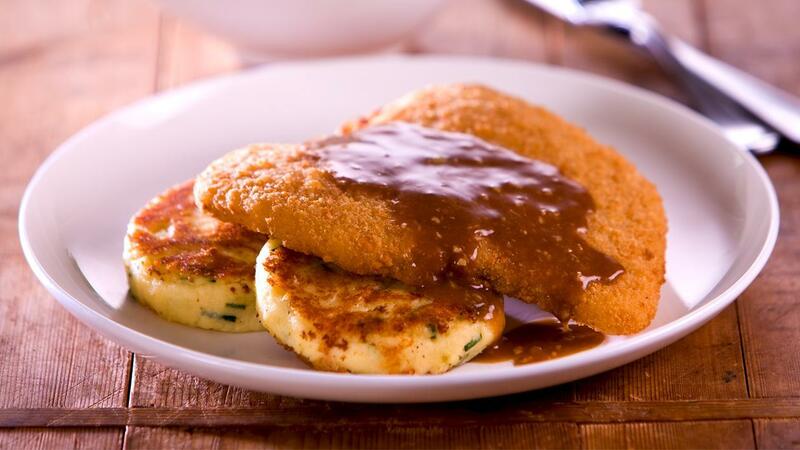 Place the potato cakes onto a plate and add the cooked Chicken Schnitzel. Pour over the garlic sauce.